Solid Walnut plaque with cast metal firemen design, includes free engraving up to 100 letters. 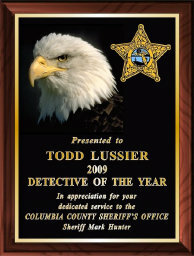 Size 9" x 12"
7" X 9" Plaque with cast metal POLICE design, includes free engraving up to 100 letters. Available in Solid Walnut or Walnut Finish.